I am a big fan of Google Docs and I store quite a number of documents there so that I can access them from where ever I have an internet connection. I don’t store anything too sensitive like my bank account details etc. This opens the whole discussion of storing your data in the "cloud". Do you fully trust the cloud services you use? Is your only copy of your data stored in the cloud? Would you miss all your email if your email provider disappeared overnight ? Being the computer guy among family and friends I often get asked to fix their PCs. Over the years I have built up a wide range of tools that I use when fixing the computers. The issues have involved cleaning spyware/viruses, fixing network issues, setting up email, rescuing personal data etc. Microsoft Windows XP CD – required for refreshing Windows files for repair or worst case scenario a full rebuild. Microsoft Windows XP SP1, SP2 and SP3 – I am surprised at the number of people who do not have these already installed. Hiren’s Boot CD – this is the Swiss army knife of Boot CDs – it includes virus scanners, many disk tools, anti spyware, file managers literally everything you could possibly need. Ultimate Boot CD – another boot cd, not quite as comprehensive as Hiren’s boot cd but still comes in handy every now and then. Ultimate Boot CD for Windows – this is one of the most important tools in my pc repair kit – it works like a Windows Live CD and allows you to boot up a machine into a seperate instance of Windows in order to repair/rescue a machine where Windows fails to load properly or is unusable due to malware. Knoppix and Ubuntu Linux Live CDs – these Linux live CDs are a must if the PC is so bad that you can’t even boot into Windows to safeguard any data. Also I have found the Linux distros more tolerant of faulty hard disks and I could rescue data when Windows didn’t even recognize the faulty disk. Malware Bytes – excellent malware removal tool, this has saved me a number of times when over products didn’t clean a machine fully. Spybot Search and Destroy – removes spyware from a Windows PC – the best I have ever used. Driver Collector – useful for creating a copy of all your hardware in Windows. Note that you need to make the copy before you run into any trouble so that you have them in one place when you need to rebuild a PC. ZoneAlarm Firewall – my Windows Firewall of choice. 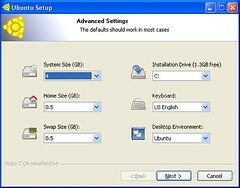 InstallPad – an excellent utility which allows you to add software to a new PC very easily. You just tick the box for each software app that you want to install and it handles everything for you. Well worth a try if you haven’t used it. SystemInfo – a very handy tool to read any system info from your PC. AutoRuns – from Sysinternals (now part of Microsoft) allows you to control any startup programs, services etc. on you machine. Brilliant for preventing nasty spyware from loading up giving you a chance to remove it. Process Explorer – gives you way more info than the standard task manager in Windows – an absolute must. Laptop Repair Videos are a great resource for helping you to fix laptops especially with so many different brands out there. Taking apart a laptop can be a daunting task but these videos walk you through the process step by step. Podnutz Podcasts – you need to keep on learning in order to keep up to speed with all the new tools and hardware. The podcasts at PodNutz cover a wide range of topics that will help you stay on top of all the latest tools available out there. You also get to hear how other PC repair technicians approach pc repairs and so can continue to learn and develop your skills. CrossLoop – I try more and more now (where possible) to fix PC problems remotely using CrossLoop (allows simple secure remote control of a Windows PC). This is one of the most user friendly remote access apps I have used and a less experienced user on the other end will have no difficulties in setting up their end of the connection. This is handy for most tasks but for the major jobs which require reboots, when not running in Windows and internet connection issues this obviously won’t help you. Well, that’s my list – do you use any other tools that I haven’t mentioned here ? Microsoft have made Windows Vista Enterprise available as a Virtual PC image for a 30 day evaluation. This is great for those of us that would like to try it out but don’t want to upgrade our systems yet. Microsoft Virtual PC 2007 is available as a free download so you have everything you need to get going. I downloaded it onto my Windows XP Pro machine and I had it up and running with no issues. One thing to watch is the virtual network card is not connected and you will need to modify this in Virtual PC before starting the image. About a month ago I decided to give Ubuntu ( a very popular distribution of Linux) a go and try it out to see what all the fuss is about. Since I am a big fan of virtualization I decided that I would use Microsoft Virtual PC 2007 to minimize the risk. I could then install it without any chance of messing up my main Windows machine. After a bit of work, I managed to create an Ubuntu Virtual PC and almost everything worked ok. The main issue I had was that it wouldn’t recognise my sound card on my home pc which was pretty annoying since I couldn’t listen to music or watch a dvd etc. I was convinced that the issue was with Ubuntu so I spent a while reinstalling ALSA drivers and all of sorts of Linux commands but to no avail. I also download a VMWare Ubuntu Image in order to test that but my sound card still was not detected. While I enjoyed working with Ubuntu I wasn’t completely happy with no sound so I investigated further. I ran the Ubuntu Live CD on my home pc and I was surprised to see that my sound card was actually recognised then. So, it turned out to be the virtualization technology that could not recognize my sound card and not Ubuntu. So this left me with only one solution, install Ubuntu on my PC and dual boot with Windows XP. I didn’t want to take the chance with the full Ubuntu install while trying to protect my Windows XP setup. The thought of partitioning my drive and messing with boot loaders didn’t really inspire me with confidence. I had come across Wubi a while back on Lifehacker and I decided to give it a try. 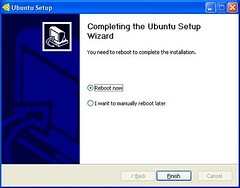 Wubi allows you to install Ubuntu from within Windows using a familiar Windows installer interface and if you ever want to remove Ubuntu you can just run the uninstaller from within Windows. Pretty neat. 2. I recommend downloading the Ubuntu (Alternate) ISO file seperately, the Wubi installer will do this for you but that is just my preference. If you do download the ISO seperately, then just place it in the same folder as the Wubi installer and it will be detected automatically. 4. Before you do anything, click on the Settings button and modify the settings based on your preferences. Since Wubi installs your Ubuntu system to a virtual disk file you can could which drive to install it on. Don’t worry it doesn’t do any partitioning or anything. System Size: This will be size of your system disk where all Ubuntu applications will be installed to, if you plan of installing plenty of software then you will need to allow plenty of space for this drive. Home Size: This is the size of your local folder where you personal preferences are stored. Swap Size: This is the size that you wish to allocate to your swap file ( if you don’t know what this is then leave it at the default). Installtion Drive: This is the drive where you want to intall the Ubuntu virtual disk drives to, it shows the space that you will have remaining on that drive based on your settings. Once you are happy with your settings, click the Next button. 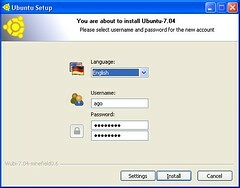 The installer will proceed to install the necessary support files prior to the Ubuntu installation. 6. When prompted to reboot, then choose Reboot Now and click Finish. 7. Once you PC reboots, the actual Ubuntu installation will begin. 8. Proceed with the installation selecting defaults where you are unsure of the selection. 9. When you boot up your computer from now onwards you will be given the option to choose either Windows XP or Ubuntu. The installation went very smooth for me and now I am happily using Ubuntu for web browsing, watching DVDs, listening to music, blogging, etc. There is the odd time that I have to boot into Windows to use some application for which I don’t have an equivalent in Ubuntu. I plan to do a few more posts in the near future about Ubuntu v’s Windows XP (application by application) and also some posts about writing .NET code from within Ubuntu using the Mono Project. and lots more. Here is the full agenda. The conference is organised by MTUG (Microsoft Technology User Groups of Ireland) and IrishDev.com in association with Microsoft Ireland. The price of the conference is only EUR50 including lunch. You can’t really beat that! I attended the Agile with Team System and DB Pro event hosted by MTUG Cork on Monday night. The evening was broken into two sessions, Brendan Lawlor firstly presented â€œCan Microsoft Development be Agile?â€ which was an excellent presentation. Brendan began by describing what he meant by Agile by drawing an unexpected but excellent analogy to Zara (an agile company in the clothing industry). He then proceeded to show how his company (Decare) has implemented the agile methodology using Microsoft Team System taking advantage of continuous integration, unit testing and refactoring capabilities built in. I really enjoyed the talk especially since I am an ethusiastic CruiseControl.Net /Nant / NUnit user for the past two years. The second session was entitled â€œIntroducing your Database Objects to the Agile Process Using Microsoft Visual Team Systemâ€ presented by Alan Crowley. Alan explained how with the emergence of Visual Studio Team Edition for Database Professionals that the database has really been integrated into the software development process. Database scripts and schemas are now treated as a standard artifact and can be subject to the same processes as regular code, including source control, refactoring and unit testing. It really showed that Microsoft have put some thought into how to bring in the work of the DBA or SQL Developer into the software development process. Overall time well spent with two very interesting sessions. Looking forward to more MTUG Cork sessions in the near future. Thanks to Joe Gill as ever for organising everything. Backing up your important files is something everyone knows that they should do but not too many people actually do it. My backup strategy at the moment consists of regularly burning DVDs or copying files to my portable HDD. Definitely far better that not backing up at all but not exactly bullet proof. I am a firm believer that you should try and automate as much as possible because when things are left to humans they don’t always get done. I have looked into online backup solutions, especially www.mozy.com where you download a client to your PC and it continually backs up your stuff. The main issue I have with an online solution is security. Mozy say that they use 128-bit (during transport) and 448-bit Blowfish encryption (on our server) so it sounds pretty secure. So maybe I would be willing to backup my digital photos but I would still be a bit slow to backup any files which I don’t want other people viewing (letters, documents, source code, etc.) Obviously there are huge benefits of the online backup strategy, your data backup is held offsite for one. Another online storage solution is www.box.net – they have just released an MS Office integrated toolbar to allow you to save your documents directly online. What is your current backup strategy? Do you use an online backup solution and if so do you worry about security ? Sometimes you just need to get your hands on a previous version of a popular software application but it is no longer available from the official website. Take for example, web browsers, let’s say that you had to test your new website on Internet Explorer 5. If you go to Microsoft’s download section you will only be able to download Internet Explorer 7 at this stage. Well if you head over to http://www.oldversion.com/ then you can download all the previous versions of many of the world’s most popular applications. Take Internet Explorer for example, you can download versions of it right back to version 1.0 (that’s going back a while now). I just took Internet Explorer as an example (I’m an avid Firefox fan) there are many other popular apps on the site. If you are developing real world ASP.NET applications then security is something that you should be concerned about. How do you make your site or application is tamper proof but still make it flexible enough from an end user point of view ?